APPI can travel to your facility to service your machine. Has your maintenance department been working on a machine for a week and still can't get it running? Have one our expert technicians come to your rescue! With years of experience and intense training, our technicians can usually get your machine up and running in one day! No one knows our equipment better than the hands that assemble and repair it every day. We also offer you to send in your machine for repairs at our facility. Having production at a stand still can be costly to a business. Loss of profits continue adding up. A new machine is not always the answer. APPI wants to see our equipment lasting years for our customers. We offer service contracts to have continued support from our technicians. Once a year, APPI will travel to your facility to replace spare/ wear parts, update settings, clean all components, and fix any issues. If you have an actual problem with a machine, you can change your maintenance date to have a technician out to fix your system instead of also having a service call. Preventative maintenance extends equipment's lifespan. Let us quote you today! Many APPI customers utilize our Service Department to help walk them through a simple repair. They can often diagnose problems over the phone. If you have attempted to resolve an issue on your Bagger but it has proven too complex for a phone diagnostic, Advanced Poly-Packaging, Inc. (APP) has service techs on call to visit your site to service your bagging systems. Installation, Set-Up, and Training: Advanced Poly Service Technicians are available for all system installations. Prior to shipment, every system is run to confirm the proper operation, but during transport issues may occur which need to be resolved on-site. Start-up issues are typically resolved quickly but some may take longer. Final costs for the service visit will be determined upon return to APP when we have had a chance to review all travel costs, our on-site time and travel time. Ti-1000Z "Zebra" Printer Rebuild. Bring your machine back to new working order! Ti-1000Z "Zebra" Printer Rebuild. Bring your machine back to new working order! Advanced Poly-Packaging, Inc. (APP) Service Personnel will completely rebuild your APP machine. APP Services include the following: Clean up all wiring. Replace all worn components. Paint stand and covers. Dismantle as required to clean all surfaces. Update programming to the most current version available (unless current program is customized). T-375 Tabletop Bagger / Printer Rebuild. Bring your machine back to new working order! Advanced Poly-Packaging, Inc. (APP) Service Personnel will completely rebuild your APP machine. APP Services include the following: Clean up all wiring. Replace all worn components. Paint stand and covers. Dismantle as required to clean all surfaces. Update programming to the most current version available (unless current program is customized). T-300 Tabletop Bagger Rebuild. Bring your machine back to new working order! T-300 Tabletop Bagger Rebuild. Bring your machine back to new working order! Advanced Poly-Packaging, Inc. (APP) Service Personnel will completely rebuild your APP machine. APP Services include the following: Clean up all wiring. Replace all worn components. Paint stand and covers. Dismantle as required to clean all surfaces. Update programming to the most current version available (unless current program is customized). T-1000-S14 Bagger Rebuild. Bring your machine back to new working order! T-1000-S14 Bagger Rebuild. Bring your machine back to new working order! 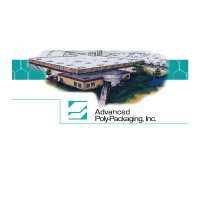 Advanced Poly-Packaging, Inc. (APP) Service Personnel will completely rebuild your APP machine. APP Services include the following: Clean up all wiring. Replace all worn components. Paint stand and covers. Dismantle as required to clean all surfaces. Update programming to the most current version available (unless current program is customized). T-1000 Clutch / Brake Rebuild. Bring your machine back to new working order! T-1000 Clutch / Brake Rebuild. Bring your machine back to new working order! Advanced Poly-Packaging, Inc. (APP) Service Personnel will completely rebuild your APP machine. APP Services include the following: Clean up all wiring. Replace all worn components. Paint stand and covers. Dismantle as required to clean all surfaces. Update programming to the most current version available (unless current program is customized). Second Training / Follow-up Service Visit: For complex systems, Advanced Poly-Packaging, Inc. (APP) recommends a second visit to reinforce training, finallze the system, perform any adjustments or repair / service any issues. Often with more complex system, customers request modifications or APP learns of additional requirements and in many cases, APP can deploy requested changes during the follow-up visit. Similar to the initial service visit, final costs will be confirmed upon the technicians return to APP, but costs should be similar to the initial service viist.